A Migrant Heart is about departures and arrivals, uprooting and attachment, resettling and returning. Denis Sampson left Ireland as a student, leaving behind the farming countryside of his childhood, the city of Dublin where he was educated, and the city and culture of his native country. He arrived in the cosmopolitan city of Montreal and discovered he was not the only one in search of a new life; and then that search became his life. He also discovered many different ways to return to Ireland, until slowly, what was painfully forced apart was rejoined in a life lived in two places and cultures. A Migrant Heart is now available worldwide from online sellers and in selected bookshops, in paperback and as an ebook. On Bloomsday 2016, the CBC Books selected A Migrant Heart as one of twelve great books by Irish Canadian authors. “Denis Sampson’s subtle and searching meditations on his Irish childhood and his Canadian manhood will strike a responsive chord in anyone who has felt spiritually and intellectually out of place. His graceful account of the people, places and writers that shaped him is always eloquent, often astute and sometimes profoundly wise.” – Mark Abley, author of Spoken Here: Travels Among Threatened Languages, The Prodigal Tongue: Dispatches from the Future of English, and other books; he is also an award-winning poet and journalist. “That rarest of things these days, an intellectual autobiography. A Migrant Heart walks the reader through a life equally of mind and place. Denis Sampson’s journey, told with quiet grace, follows the road so many take to Canada – via the map of their own culture and upbringing. A gentle, thoughtful exploration of one Irishman’s rambles.” – Charles Foran, author of The Life and Times of Mordecai Richler, The Last House of Ulster, Sketches in Winter: A Beijing Postscript, and other books, including five novels. “Like the best examples of the growing creative non-fiction hybrid genre of which it is a part, ‘A Migrant Heart’ charts with touching delicacy and frank self-examination an intellectual and spiritual journey as much as a physical one.” Ian McGillis, Montreal Gazette. “In A Migrant Heart, a contemplative book about one man’s faith in literature’s ability to anchor a life of shifting attachments and estrangements, Denis Sampson justifies the practice of memoir writing in revealing and, ultimately, self-fulfilling terms.” Kamal Al-Solaylee, Quill and Quire (Toronto). “This is a memoir of moving honesty and depth. It carries the glint of wisdom in the cadences of its recollections and reflections. Much of the charm of the book comes from the acuity with which Sampson recalls his Irish childhood, and the intelligence he brings to bear in understanding how it has influenced the person he has become.” Chris Arthur, New Hibernia Review, Summer 2015. 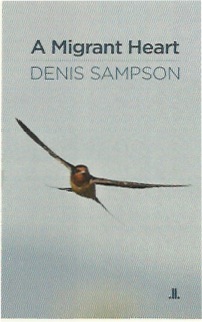 “Denis Sampson’s graceful prose effortlessly carries the reader on his many journeys – from rural Ireland to Montreal by way of loss and love, over mind-opening vistas and through life-making moments.” George O’Brien, author of The Village of Longing, Dancehall Days, and Out of our Minds. “Beautifully written and exquisitely crafted. The descriptions are wonderful, and the voice is constantly engaging. As writing, it’s just a triumph.” Eamonn Wall, author From the Sin-e-Cafe to the Black Hills: Notes on the New Irish, Writing the Irish West, and six volumes of poetry. “It’s not only good but necessary for the ecology of literature to have books as intelligent and thoughtful as this. Books like this give readers a sense of what constitutes real value and the real worth of literature. Highly recommended.” Carlo Gebler, Dublin Review of Books, January 2015, author of Father and I: A Memoir, and many other works of fiction and non-fiction. “This is a memoir of keenly-observed and hard-won truths. Sampson explains to us, as he searches for the elusive Ireland of his imagination, how many of the turbulent currents we carry within us, wherever we go, can find peace through the balm of literature.” Peter Cunningham, Independent, 22 March 2015, author of The Sea and the Silence and many other novels. “One man’s journey through life, from Ireland to Montreal and back, is also a thought-provoking story of coping with life’s vicissitudes and finding a place in the world.” Books Ireland, May/June 2015. “He sees his life as an attempt to learn to truly speak – he may be more like his father than he once believed – to find his real voice, a voice he suggests he has found in writing. For the reader the interest lies in how well and honestly he uses that voice. And in some ways he uses it rather beautifully.” Anne Haverty, Irish Times, 10 May 2015. I am sitting in the Caffè Stella Polare in Trieste in the late afternoon. The brochure for the James Joyce walking tour led me to this café, where the Irishman had once spent evenings drinking. I have spent an hour or two looking for some of the places associated with his decade of uncertain settling in Trieste a century ago, the years when he distanced himself from his childhood and youth in Dublin, and from the persona of the artist as superior young man. Here Joyce embraced Leopold Bloom, the down on his luck, middle-aged Jew, as the hero of Ulysses, his book of wandering, and I try to imagine the crossroads of many cultures he found in this great commercial port of the Austro-Hungarian empire. Lovers and families now stroll on the molos, the broad quays that jut out into the Adriatic, but there are no longer any ships setting out to travel the oceans, with sailors spending months at sea, finding their way by reference to the Pole star. I did not come here to follow the traces of my countryman’s exile. Over the decades of my friendship with Iztok in Montréal, he has mentioned this city so often, and this region stretching from Venice to Ljubljana. It is the world of his first years before emigration to Canada and of the past decade of regular returns, and of all his life, a place of shifting borders and histories, of nostalgia and brutality, of loss and desire. Over glasses of Tokaj and in print, he has challenged the romantic images of Jan Morris, who writes about the city as ‘nowhere’, and corrected Hemingway’s superficial knowledge of the Italian-Slovenian borderlands and battlefields. And for me Iztok has brought back wines from vineyards above Trieste which all have their histories. We have actually met in Venice on the Zattere, and ate and drank in his haunts in Dorsoduro and Giudecca, but I have always known that this place farther east is Iztok’s world, a place of nightmares and memories I could never hope to really enter. Our friendship is of Montréal, the place of our displacement, and although he has not expressed any wish to visit Ireland, I have wanted for years to see his other place beyond Venice, beyond tourism, where corrections are always necessary. I am sitting in the Caffè Stella Polare when I suddenly realize something about Iztok, and about myself. I realize that through all our years in Montréal, a Pole star has hovered above us. Whatever his friends might think of his obsessive and loving returns here in conversation, or of his preoccupation with minute details of linguistic or historical accuracy, each detail is the trace of Slovenian lives that disappeared during the Italian occupation, or the German occupation that followed, or the Communist exterminations and silencings that followed. In the preface to a volume of his translations of the poems of Edvard Kocbek, he wrote: ‘In a country as small as Slovenia, what to you is history, is autobiography to me. The volume, like the lives of my parents, of Kocbek’s generation, is divided into three parts: Before, During, and After. The During is the Second World War, a civil war in Slovenia, because of which I’m a Canadian and because of which my parents even now sigh, “If things changed down there, we’d go back in a minute.”’ But there is something about this sigh that reveals what he knows – that they would not go back. Nor did they, even when it became possible in the nineties, and in this they are like many post-war migrants in Canada. Following their ‘After’, there was another After. And as soon as I think of the celestial metaphor for Iztok’s life, I remember standing with my father on a dark night some distance away from the farmhouse of my childhood in the west of Ireland and looking up at the night sky. More than fifty years ago, he showed me the stars that make up the Plough and then how to find the North Star by following a line from the two stars at its extremity. This life-long farmer, my father, had ploughed these fields. He had no reason to know more than this one celestial formation, or indeed anything about the night sky except for signs he might find there that would help him predict the weather for the next day’s work. He lived in the same place all his life, the farm on the shores of Lough Derg, on the border between counties Clare and Galway, and now I realize that this memory coming to me in the café in Trieste is offering me something for myself at this late stage of my life away from that countryside.